On a small atoll emerging from the Tyrrhenian Sea, very close to the coast, stands the wonderful Aragonese Castle of Ischia, the island of the Phlegraean Islands. In fact Campania is full of castles often close to the sea, because in ancient times they were excellent visual and strategic locations. The tiny trachytic island on the eastern side of Ischia is connected to the island by a masonry bridge of about 220 m which led directly to the ancient village of Celsa, now known as Ischia Ponte. Geologically the isle, where the Aragonese Castle is raised, is a magma bubble derived from the volcanic eruption happened more than 300,000 years ago and over time it became solidified thanks to the next eruptions, giving rise to the phenomenon known as the Cupola of stagnation. The fascinating Aragonese Castle is a favorite destination for the tourists from all around the world, especially in the summer, who almost attack the island of Ischia, filling it up with colors and noises. 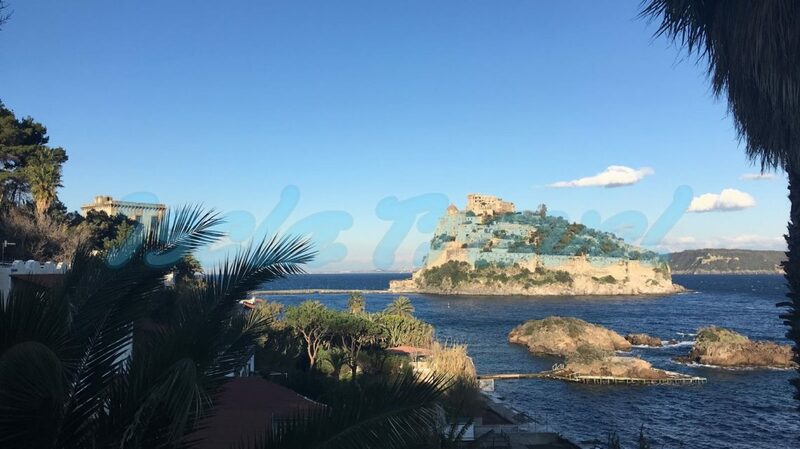 In fact, the Aragonese Castle is one of the most important places that allow to develop and expand the tourism of Ischia, an island loved for its natural beauty, its landscaped scenery and its delicious, tasty and succulent food. The Aragonese Castle in fact, a fortress dug in the rocks and positioned “on the waves of the sea”, was built by Alfonso V of Aragon in the middle of the 14th century and accessed through a tunnel; before the construction of the fortification on the island it was reachable only by the sea. The period of its maximum splendor took place in the 16th century: the Aragonese Castle hosted the convent of the clarisse, the abbey of the Basilian monks of Greece; there were also 13 churches, including the famous cathedral where the wedding between Francesco Fernando d’Avalos, marquis of Pescara and the leader of the imperial soldiers of Charles V, and the poet Vittoria Colonna was celebrated in December of 1509. Thanks to the presence of the poetess the Aragonese Castle was a meeting place and a place of residence for many important figures of the time, such as Michelangelo Buonarroti, Ludovico Ariosto, Annibale Caro, Jacopo Sannazaro, Giovanni Pontano, Bernardo Tasso and many others. Today, the Aragonese Castle, given its charm and its marvelous features, is used as a location for numerous exhibitions of the famous artists such as Giorgio De Chirico, Pablo Picasso, Salvador Dalì and Giorgio Morandi, Giacomo Manzù, Filippo de Pisis, Aligi Sassu and many more. During the summer season, the castle is often used as a venue for musical, theatre and performance festivals, crowded and admired by tourists from all over the world. It was purchased in 1912 by the ancestors of the current owners for 22 thousand lire. Castello Aragonese offers a fascinating glimpse into the history of the island as well as providing a beautiful and dramatic addition to the landscape. It was the home to 2,000 inhabitants of the island and has also been used as a prison in times of conflict. The Castle is opened between 09:30 and 19:00. Do you want to visit "Castello Aragonese"?